This is the fourth post in a series of posts on how to build a Data Science Portfolio. You can find links to the other posts in this series at the bottom of the post. 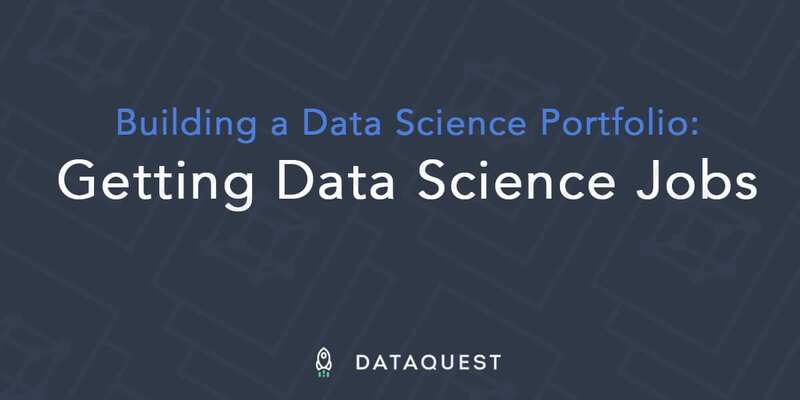 In the past few posts in this series, we’ve talked about how to build a data science project that tells a story, how to build an end to end machine learning project, and how to setup a data science blog. In this post, we’ll take a step back, and focus on your portfolio at a high level. We’ll discuss what skills employers want to see a candidate demonstrate, and how to build a portfolio that demonstrates all of those skills effectively. We’ll include examples of what each project in your portfolio should look like, and give you suggestions on how to get started. After reading this post, you should have a good understanding of why you should build a data science portfolio, and how to go about doing it. Extracting insights from raw data, and presenting those insights to others. An example would be analyzing ad click rates, and discovering that it’s much more cost effective to advertise to people who are 18 to 21 then to people who are 21 to 25 — this adds business value by allowing the business to optimize its ad spend. Building systems that offer direct value to the customer. An example would be a data scientist at Facebook optimizing the news feed to show better results to users — this generates direct revenue for Facebook because more news feed engagement means more ad engagement. Building systems that offer direct value to others in the organization. An example would be building a script that automatically aggregates data from 3 databases and generates a clean dataset for others to analyze — this adds value by making it faster for others to do their work. Sharing your expertise with others in the organization. An example is chatting with a product manager about how to build a feature that requires machine learning algorithms — this adds value by preventing unrealistic timelines, or a semi-functional product. A well-rounded portfolio should show off your skills in each of the above areas, and be relatively easy for someone to scan — each portfolio item should be well documented and explained, so a hiring manager is able to quickly evaluate your portfolio. If you have a degree in machine learning or a relevant field from a top-tier school, it’s relatively easy to get a data science job. Employers trust that you can add value to their business because of the prestige of the institution that issued you the degree, and the fact that it’s in a subject that’s relevant to their own work. If you don’t have a relevant degree from a top-tier school, you have to build that trust yourself. Think about it this way: employers can have up to 200 applicants for in-demand jobs. Let’s say that the hiring manager spends 10 hours total filtering the applications down and deciding who to do a phone chat with. This means that each applicant is only evaluated for 3 minutes on average. The hiring manager starts off with no trust that you can add value to the business, and you have 3 minutes to build their trust to the point where they decide to do a phone screen. The great thing about data science is that the work you do on your own building projects often looks exactly like the work you’ll do once you’re hired. Analyzing credit data as a Data Scientist at Lending Club probably has a lot of similarities to analyzing the anonymous loan data that they release. The first few rows of the Lending Club anonymous data. The number one way to build trust with a hiring manager is to prove you can do the work that they need you to do. With data science, this comes down to building a portfolio of projects. The more “real-world” the projects are, the more the hiring manager will trust that you’ll be an asset to the business, and the greater your chances of getting to a phone screen. Now that we know we need to build a portfolio, we need to figure out what to put into it. At the minimum, you should have a few projects up on Github or your blog, where the code is visible and well-documented. The easier it is for a hiring manager to find these projects, the easier it is for them to evaluate your skills. Each project should also be as well-documented as possible, with a README file both explaining how to set it up, and explaining any quirks about the data. A well structured project on Github. We’ll walk through a few types of projects that should be in your portfolio. It’s suggested to have multiple projects of each type, especially if the type of role you want aligns with one or the other. For example, if you’re applying to positions that require a lot of machine learning, building more end to end projects that use machine learning could be useful. On the other hand, if you’re applying for analyst positions, data cleaning and storytelling projects are more critical. A data cleaning project shows a hiring manager that you can take disparate datasets and make sense of them. This is most of the work a data scientist does, and is a critical skill to demonstrate. This project involves taking messy data, then cleaning it up and doing analysis. A data cleaning project demonstrates that you can reason about data, and can take data from many sources and consolidate it into a single dataset. Data cleaning is a huge part of any data scientist job, and showing that you’ve done it before will be a leg up. Try using data.gov, /r/datasets, or Kaggle Datasets to find something. Avoid picking anything that is already clean — you want there to be multiple data files, and some nuance to the data. Find any supplemental datasets if you can — for example, if you downloaded a dataset on flights, are there any datasets you can find via Google that you can combine with it? The first part of our earlier post in this series, Analyzing NYC School Data, steps you through how to create a complete data cleaning project. You can view it here. A data dictionary of some of the NYC school data. The NYC subway, in all its glory. A data storytelling project demonstrates your ability to extract insights from data and persuade others. This has a large impact on the business value you can deliver, and is an important piece of your portfolio. This project involves taking a set of data and telling a compelling narrative with it. For example, you could use data on flights to show that there are significant delays at certain airports, which could be fixed by changing the routing. Picking something that is related to current events can be exciting for a reader. The second part of our earlier post in this series, Analyzing NYC School Data, steps you through how to tell a story with data. You can view it here. A map of SAT scores by district in NYC. Lyrics mentioning each primary candidate in the 2016 US elections (from the first project above). So far, we’ve covered projects that involve exploratory data cleaning and analysis. This helps a hiring manager who’s concerned with how well you can extract insights and present them to others. However, it doesn’t show that you’re capable of building systems that are customer-facing. Customer-facing systems involve high-performance code that can be run multiple times with different pieces of data to generate different outputs. An example is a system that predicts the stock market — it will download new market data in every morning, then predict which stocks will do well during the day. In order to show we can build operational systems, we’ll need to build an end to end project. An end to end project takes in and processes data, then generates some output. Often, this is the result of a machine learning algorithm, but it can also be another output, like the total number of rows matching certain criteria. Our earlier post in this series, Analyzing Fannie Mae loan data, steps you through how to build an end to end machine learning project. You can view it here. It’s important to be able to understand and explain complex data science concepts, such as machine learning algorithms. This helps a hiring manager understand how good you’d be at communicating complex concepts to other team members and customers. This is a critical piece of a data science portfolio, as it covers a good portion of real-world data science work. This also shows that you understand concepts and how things work at a deep level, not just at a syntax level. This deep understanding is important in being able to justify your choices and walk others through your work. In order to build an explanatory post, we’ll need to pick a data science topic to explain, then write up a blog post taking someone from the very ground level all the way up to having a working example of the concept. The key here is to use plain, simple, language — the more academic you get, the harder it is for a hiring manager to tell if you actually understand the concept. Machine learning algorithms like k-nearest neigbhors are good concepts to pick. Statistical concepts are also good to pick. Make sure that the concept has enough nuance to spend some time explaining. Make sure you fully understand the concept, and it’s not too complex to explain well. Pick a dataset or “scaffold” to help you explain the concept. For instance, if you pick k-nearest neighbors, you could explain k-nearest neighbors by using NBA data (finding similar players). While the key is to have a set of projects on your blog or Github, it can also be useful to add other components to your project, like Quora answers, talks, and data science competition results. These are often of secondary concern to a hiring manager, but they can be a great way to stand out and prove your skills. Talks can be useful ways to help teach others and demonstrate to hiring managers that you know a topic well enough to teach others. This helps a hiring manager understand how good you are at communication and presentation. These skills overlap with some of the portfolio pieces somewhat, but are still useful to demonstrate. The most common place to give a talk is at a local Meetup. Meetups are all focused around specific topics, like “Python”, or “Data visualization using D3”. Data science competitions involve trying to train the most accurate machine learning model on a set of data. These competitions can be a great way to learn. From a hiring manager’s perspective, a data science competition can demonstrate technical competence if you do well, initiative if you put in a good amount of effort, and collaboration if you work with others. This overlaps with some of the other portfolio projects, but it can be a nice secondary way to stand out. Most data science competitions are hosted on Kaggle or DrivenData. To participate in a data science competition, you just need to sign up for the site and get started! A good competition to get started with is here, and you can find a set of tutorials here. 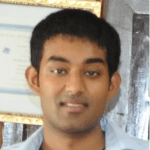 The leaderboard of a Kaggle competition. You should now have a good idea of what skills to demonstrate in your portfolio, and how to go about building your portfolio. Now it’s time to start building! If you have a portfolio you’d like to show off, please let us know in the comments!